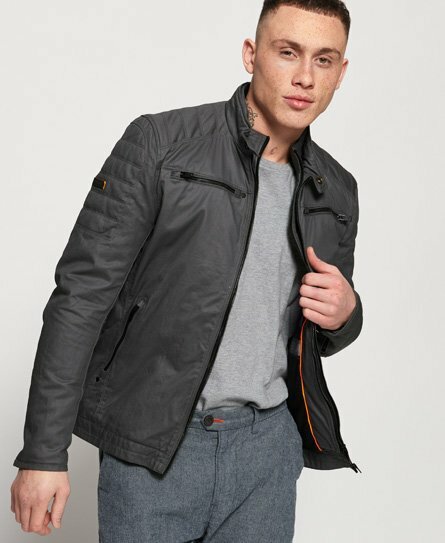 Superdry men’s Carbon biker jacket. Make an impression this season wearing this biker jacket, a staple jacket that will add attitude to any look. Featuring a double collar design, a double zip fastening and zip detailing on each cuff. This jacket has four zip pockets and a Superdry badge on the sleeve for a premium finish. Inside, the jacket has comfortable quilted lining to add some warmth. For a key look this season, pair this biker jacket with ripped jeans, an oversized tee and boots, or if you are thinking more casual vibes, opt for some cargo pants and a tee.